Should holiday email be deleted? German vehicle-maker Daimler has an innovative approach to holiday email, which many people about to return from holiday may well wish their company would copy, writes William Kremer. There ought to be a word - and perhaps there is, in German - for the mix of feelings that accompanies composing and activating a holiday out-of-office message. There's smugness, of course, and a gratifying sense of laying down one's virtual tools after a horribly long shift. But for many of us, these nice feelings are tempered by the knowledge that in two weeks, refreshed but depressed, we will have to trawl through hundreds of emails, many of which will be conference room notifications for meetings about crises that have passed. I am on vacation. I cannot read your email. Your email is being deleted. Please contact Hans or Monika if it's really important, or resend the email after I'm back in the office. Danke Schoen. Apparently, people receiving such a notification rarely get angry. "The response is basically 99% positive, because everybody says, 'That's a real nice thing, I would love to have that too,'" Daimler spokesman Oliver Wihofszki told BBC Radio 4's Today programme. Holiday envy has been replaced by corporate email policy envy. "Taking time off completely, stress experts say, is essential if we are to connect with our families and with our souls and recharge our batteries. "But in my experience it doesn't work quite like this. A human battery is a funny piece of kit, and doesn't always respond well to a sudden, cold-turkey immersion in idleness with the family in a strange place." The response on Twitter has also been overwhelmingly positive. "I love Daimler's approach to holiday email," says the entrepreneur Nuno Almeida, while the FT's Hanna Kuchler tweets: "Now this is email management." 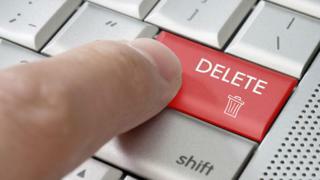 The auto-delete policy - which is optional - follows a piece of government-funded research on work-life balance, which Daimler carried out in 2010 and 2011 with psychologists from the University of Heidelberg. The company now trains managers to set a good work-life example, and encourages them to set aside time when no meetings can be scheduled. This is supposed to be a time when workers can concentrate on their job, or take time off for any extra hours they have spent in the office. Daimler's move follows Volkswagen's decision to turn email off after office hours and new guidelines in France ordering workers in some sectors to ignore work emails when they go home. It's not pure altruism though, as the company explained when the policy was launched: "The aim of the project is to maintain the balance between the work and home life of Daimler employees so as to safeguard their performance in the long run." Subscribe to the BBC News Magazine's email newsletter to get articles sent to your inbox.